The official tie-in to Columbia Pictures' hit holiday movie, from the co-director of the animated hit The Lion King-with over 200 illustrations, the script and story behind Sony Pictures Imageworks' latest state-of-the-art computer and imaging wizardry that brought E.B. White's classic mouse to life on-screen. 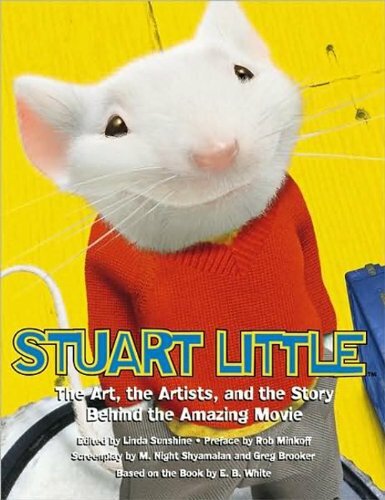 Though only a three-inch mouse, Stuart Little represents as huge an advance in filmmaking as his long-ago predecessor, a mouse named Mickey. Now digital characters, complete with personality performance and lifelike qualities, share the screen with live actors-both human and feline. All of these elements were combined to make a seamless film. The result is nothing short of astonishing. How did they do that? Stuart Little: The Movie and the Moviemakers answers that question in stunning detail. Including the shooting script, and illustrated throughout with photos, paintings, blueprints, line drawings, computer graphics, and footnotes, this book explains how the movie incorporates groundbreaking visual effects technology in the realm of photo-realism by the artists and innovators of Sony Pictures Imageworks. The book also details the development of innovative software by Alias/Wavefront and other leading digital firms. For film buffs and fans of Stuart, Stuart Little: The Movie and the Moviemakers is a joyful celebration of the evolution of E.B. White's beloved 1940s classic mouse into an actor for the new millennium. The cast features: Geena Davis as Mrs. Little, Hugh Laurie as Mr. Little, Jonathan Lipnicki as George, Michael J. Fox as the voice of Stuart, Nathan Lane as the voice of Snowbell the Cat. Filmmakers include: Director Rob Minkoff (The Lion King), Producer Douglas Wick Wolf, Working Girl), Special Effect Supervisor Jerome Chen (Contact), Senior Visual Effects Supervisor John Dykstra (Star Wars: A New Hope), Animation Director Henry Anderson (Coca Cola's Polar Bears).